Bharat Sanchar Nigam Limited (BSNL) has announced the launch of 5 new High speed Value for money “Unlimited Broadband Flexi combo Plans”. The BSNL competent Authority decided to offering per month plans starting from Rs.500, Rs.750, Rs.1000 and Rs.1500. Under Limited plans starting download speed for General Plan of Rs.500 offers 2 Mbps upto 3GB and 256 Kbps beyond the usage limit along with Free Local and STD calls under this plan. Under Unlimited Plan BSNL offer Flexi General UL combo 4 Mbps of Rs.1500 offers Unlimited Broadband usage for one month and Free Local and STD calls per month plan. 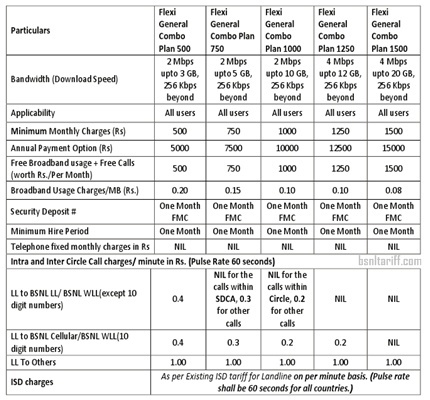 Customers can avail all the plans as mentioned in the below bsnltariff will be available from the 01-07-2012 onwards. BSNL HQ has passed its instructions to all its Telecom circles to implement the same with the date effect and make necessary arrangements to offer the same for the customers in all the BSNL Telecom Circles.